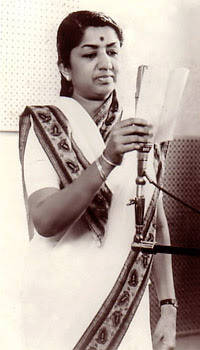 Lata Mangeshkar was on a local train, on her way to meet her guru and music director Kemchand Prakash. It was when she alighted from the train that she noticed a man following her. There were no motor vehicles at that time, so you had to hire a horse carraige to travel. Lata beckoned one and much to her alarm, she saw the man following her in another carraige. Lata got down at her destination and hurried to her guru's home. On seeing the other carraige stop outside the home, Lata told her guru, " That man has been following me all the time." The man was already walking towards Prakash's home. Kemchand Prakash smiled and said, "This is Kishore, Ashok's little brother. He is here to learn too..."
That is how the Hindi film playback legends Lata Mangeshkar and Kishore Kumar first met.